【All HAS SMALLER COMPARTMENT】 in the main pocket of the waist bag perfect for credit cards, IDs ,single keys ,iPhone 7/6S plus Galaxy S5,S6,Note 6,wallet,running accessories etc,this running bag is plenty big for all of your stuff with room to spare. 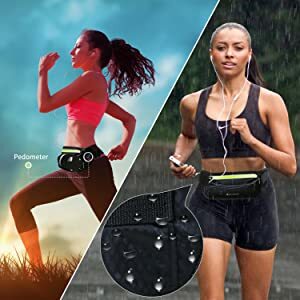 【ADJUSTABLE RUNNING BELT】 water pack for women and men from sizes 76cm to 115cm(30-45 Inches),you can adjust the waist range of the running belt as your request, and two-way zipper design makes the water pack to be a flexible running pack (Easy adjustable waist pouch). 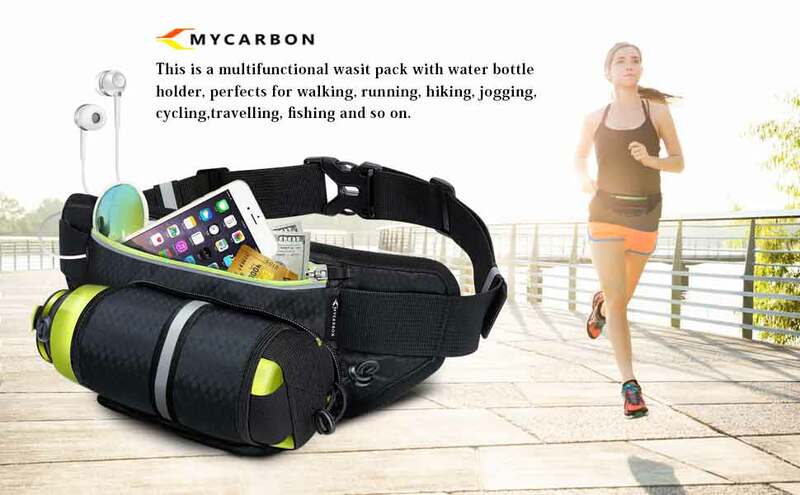 【MULTIPLE REFLECTIVE STRIPS 】on the cycling water bottle pack MAKES YOUR SAFETY RUNNING at night,and this cycling water bottle fanny pack is suitable for hiking,cycling, travel, leisure activities, entertainment(Safety night running waist bag),and perfect as gifts. 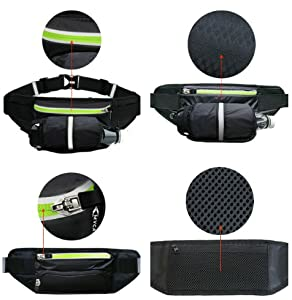 【Little HEADPHONE HOLE】 in the fanny pack with water bottle holder ,you can string your headphones through and enjoy the music when the hydration pack belt is zipped tight and funny running with this waist pack. Adjustable waist pouch also can be a wallet,tool kit,cheese pack and two-way zipper design makes it to be a Multi functional water pack. Please keep the water packs clean and dry after doing sports in order to avoid the mildew after long time unventilated placement. Please don't soak it in the water and can't wear it while swimming or diving for its water resistant function. Our fanny bag is made of high quality waterproof material with safety reflective strips,this water bottle pack can protect your objects even when the water drops on the lumbar pack and MAKES YOUR SAFETY RUNNING at night. Made in high grade water resistant in the front of the waist bag and breathable net fabric on the back of the fanny pack waterproof. 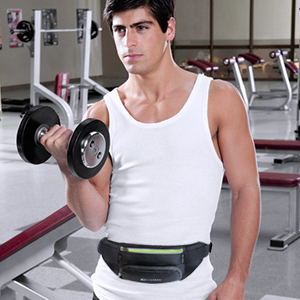 Relaxing your shoulder, reducing pressure,feeling free to carry the water bottle with fanny pack. 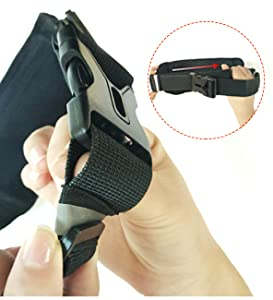 Waist strips are adjustment,it is easy to adjust the straps for your size,this water bottle pack is good for walking,running,hiking,jogging,cycling,travelling. 1.There is an inter layer and a buckle in the main pocket,you can store all your things like ihone 7/6S Plus,Galaxy S6 S7,Note 6,keys,ID and so on in this waist pack,you can do exerices with hands free,Good Waist Pack for Keep Fit. 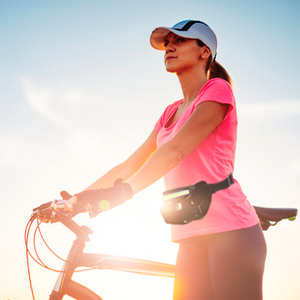 2.There is a Unique Invisible water bottle holder in this cycling fanny pack,allows you to carry the water bottle invisibly and conveniently,easy to take out the water bottle from the fanny bag and drink the water after riding. 3.There is opening headphone hole in the running pack makes you have the privilege of listening to music when the belt is zipped tight to protect your belongings in the water bottle pack.